Arizona Center in Phoenix, AZ includes restaurants, retail shopping, and office space. It had 17,900 square feet of complex roof that was plagued with extensive leaks since its installation in 1987. After a roof consultant estimated replacement costs of the metal roof and skylights to be well over $1 million, owner General Growth Properties contacted Clark’s Quality Roofing to determine if there were other less-costly alternatives that would maintain the aesthetics of the existing metal roof. The roof design requires so many joints and seams it is impossible for a metal system to maintain a watertight condition. The roof is a curved elliptical half circle that is further divided into ridges and valleys that create a saw-tooth effect. Interior gutters located in the valleys channel water to the center flat roof where it is removed by interior drains. Five hundred and forty-five linear feet of angled skylights add to the complex design, requiring even more seams. Innovate the appearance of metal ribs by welding PVC strips to the membrane. The roof design required so many joints and seams it was impossible for a metal system to maintain a watertight condition. The roof is a curved elliptical half circle that is further divided into ridges and valleys that create a saw-tooth effect. Interior gutters located in the valleys channel water to the center flat roof where it is removed by interior drains. Five hundred and forty-five linear feet of angled skylights add to the complex design, requiring even more seams. 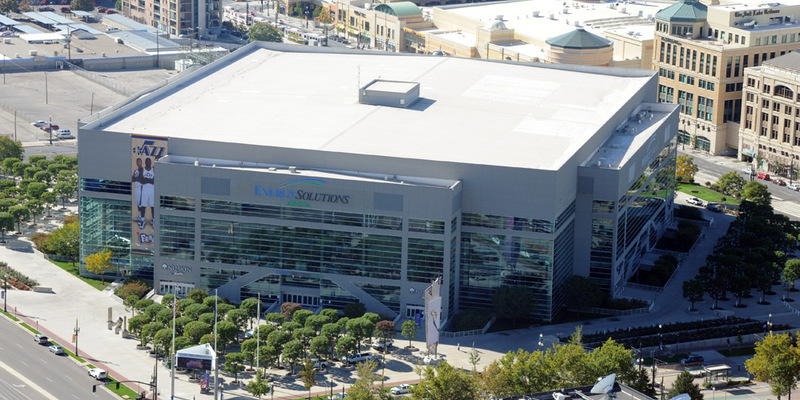 CQR installed a colored PVC single-ply membrane on top of the existing roof and gutters, creating a monolithic covering. The look of metal was created by welding PVC strips that mimic metal ribs to the membrane. The skylights were the main source of leaks. They were installed too low to properly connect and seal to the existing roof system or to a new roof system. The consultant determined the skylights needed to be replaced, at a cost of $500,000. The skylights only extended above the roof one-half inch. Industry standards require a minimum of 8″ to allow enough height to properly attach and seal the skylights to the roofing system. It was impractical to raise the skylights because they were mounted to structural beams beneath the 2 ½” wood deck. Design an innovative way to lower the roof surrounding the skylights. CQR designed an innovative solution that was pivotal in enabling a recover of the existing roof rather than a complete roof replacement. Since the skylights could not be raised, CQR lowered the roof surrounding the skylights by removing the adjacent, metal roof panel and four inches of insulation. This created a trough that connected and extended the current gutter system along the skylights, exposing enough of the skylight to properly seal to the roofing system. The owner did not want any roofing work to disrupt the tenants or patrons of this busy downtown attraction. This key downtown attraction houses office areas that open early in the morning and restaurants that close late at night. Minimize scope of work needed and did all the work at night. CQR began work at night after the restaurants closed and ended work early in the morning, before office workers arrived. Recovering the roof rather than re-roofing further reduced the disruption because the project was completed in two months rather than the projected six months. 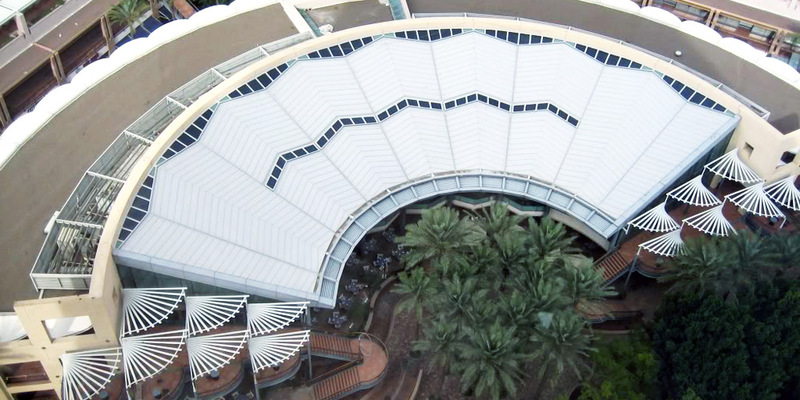 Clark’s Quality Roofing developed alternate solutions that made it possible to recover the Arizona Center roof instead of completely removing and replacing it. This solution saved the owner over $700,000, maintained the look of a metal roof, and was less disruptive to the tenants and patrons of the busy property.